Tell us the story of Clover and Emilia Pottery, how did it start? My relationship with clay all started from a taster throwing workshop 7 years ago. Just like love at first sight, I felt synchronised with the potter’s wheel from that moment on. With the opportunities to learn my pottery skills in my spare time, thanks to all the people and organisations who support adult education in art and craft, I was able to take part in the Great Pottery Throw Down 2017, where I surprisingly went through to the final and even made a functional toilet, which I never thought I would ever do. Most importantly, this experience transformed me from not knowing what to do with pottery, to becoming a full time potter, dedicating a significant amount of my time to teaching, as a way to give back to those organisations and individuals that guided and supported me over the years. Nevertheless, after 6 years of being a learner at evening class, and a year and a half of working as a full-time potter, I continue to feel the magic of working on the wheel. From a young age, I have always loved creating with clay. The medium is so versatile, so your imagination can run wild. I completed a degree in Ceramics in Australia and travelled widely, which brought many opportunities for working in ceramics, my particular favourite, providing technical assistance to other artists who wanted to create work in the ceramic medium. I started teaching adult education courses and assisting with teaching at a tertiary level after graduation, and then moved to Scotland where I set up my own evening courses from my studio and found how much I enjoyed sharing my skills and my love of throwing with others… 10 years later… I moved to London. 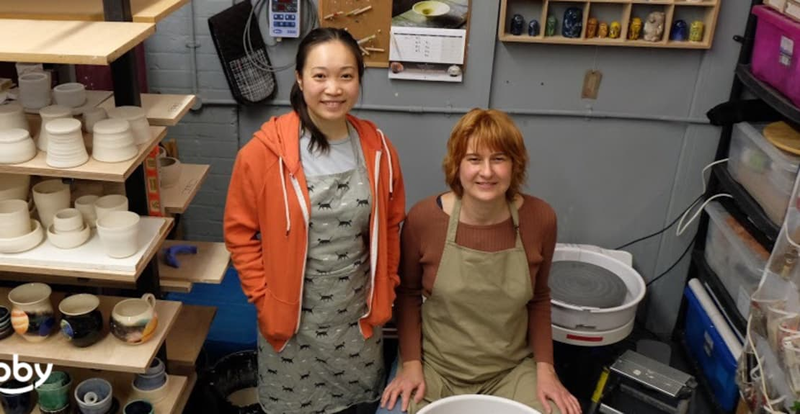 We met in London in 2017, both filled with passion for teaching pottery. We decided to set up a studio where we could welcome anyone who has a love and desire to learn and enjoy working with clay. Our vision was to create a space where learners can enjoy a calm and peaceful environment in a small group. Using tailored teaching methods, we give individual support, to give you a creative outlet and a way to unwind while also learning a new skill. How do you choose your venue spaces? We chose to base our studio at one of ACAVA’s buildings (Association for Cultural Advancement through Visual Arts) because they are an educational charity and share the vision for the promotion of artistic skills. Our studio is situated among others and we love the creative and friendly environment that being in an artistic community that this provides. We also found it really important to be close to public transport for easy access. Our studio is a 10 minute walk from South Wimbledon tube station or a 5 minute tram ride to Wimbledon. We are equipped with 7 potter’s wheels, and two kilns (one of which is called Munchkin, named by Clover, after a breed of cat). We stock 3 types of clay, over 20 different glazes as well as other decorating materials. A large group booking, normally classes are smaller than this! It is impossible to choose our favourite activity! Recently we offered a weekend of free throwing workshops as part of Hey Clay, which is an annual celebration of working with clay, organised by the Crafts Council. It was really fantastic fun. We also participated in the Merton Arts Festival, which is an annual event, a weekend of Open Studios, showcasing the best work made by us and our students. Best of all, it gave us an opportunity for meeting and connecting with lots of folks in the local community. And we must mention our monthly Craft and Beer Night: a combination made in heaven! Everyone has a go at the potter’s wheel while enjoying craft beer and mingling with friends and pottery enthusiasts! What’s a day like in the life of Clover and Emilia Pottery? Every day is different. On some days, all wheels are out and working hard to facilitate pottery classes. On the days where they have a break, Mr. Shelves is holding all the pots in position for drying. The most hard working staff member in the studio is Munchkin, he sometimes fires back to back so our learners could collect their pots sooner. Of course we have pottery fairies that come in at night to clean and organise everything. While we just sit on the side and chill. But seriously, we are working and open 7 days a week, sometimes late into the evening, so that classes and opportunities for individual creating are conveniently available for you. What is next for Clover and Emilia Pottery? We are always looking to improve our facility and to make our service better and better. We would love to in the near future recruit a new plant as a concierge, perhaps a pottery dog as a mascot. We hope to have more regular classes, and make individual booking more flexible. We are planning to organise a raku and pit firing workshop, so we can burn any unwanted pots and paperwork!